(Phys.org) -- What’s in a name? Quite a bit in climate science, where the term teleconnection refers not to digital communications, but rather to a recurring and persistent large-scale pattern of pressure and circulation anomalies that spans vast geographical areas. 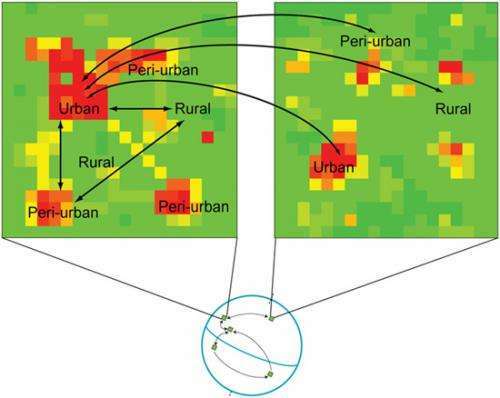 Recently, environmental researchers at Yale School of Forestry & Environmental Studies reframed the discussion around the linkages between land changes and underlying urbanization dynamics by introducing urban land teleconnections as a conceptual framework for studying the multivariate nature of these processes in an integrated and productive manner. Associate Professor Karen C. Seto describes the conceptual and evaluative challenges in jointly evaluating land classification that asserts a rural–urban dichotomy, place-based spatial quantification, and assumptions about path dependency and sequential land changes. “A single location may have limited land covers – that is, what’s actually on the landscape, such as trees, concrete, and buildings – but land use is multi-dimensional, even at one location,” Seto tells Phys.org. “For example, a plot that has trees could be an orchard for farm or agricultural use, a recreational park, biodiversity corridor, carbon sink, and so on. To say that one place is only rural or only urban is fundamentally contrary to how the land is actually being used.” Furthermore, she points out, urban and rural are poorly defined. 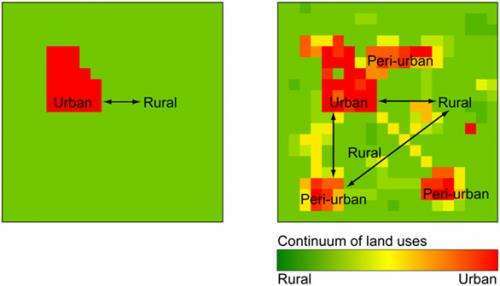 In reality, it’s not only a gradient, but more likely a matrix of types of rural-like and urban-like uses. “When we assume that there are path dependencies with land use, as when forest becomes agriculture becomes urban, we only look for patterns that fit those trajectories,” Seto continues. “Neglecting the complex, overlapping and multifarious nature of urbanization and land use change processes – and in particular, the role the distal connections between them – can lead to misguided sustainability policies and practice, deviations from paths of sustainable development and missed opportunities for increases in human well-being.” In addressing these issues, one of the researchers’ key conclusions was that neglecting the distal connections between land change and urbanization can lead to incorrect conclusions, misleading results, and unintended negative consequences in distal places. Going forward, there are a number of additional research innovations the team has planned. 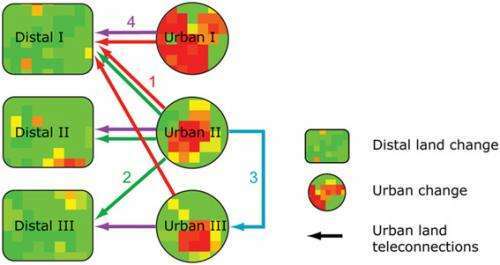 “One of the things we wanted to underscore in the paper is that there are actually many methods that already exist which could be employed to analyze urban land teleconnections,” notes Seto. “The problem is that they’re not being integrated or utilized in new ways to address this issue.” In additional, she adds, they’re exploring ways to operationalize the concept with data. Another important effect is how urban land teleconnections could help research communities frame scientific inquiries. “If we continue to conceptualize urban or land-use sustainability as a solely localized issue and don’t link them to the underlying drivers or impacts that are located in distal places, we’re unlikely to develop policies or solutions that have meaningful systemic impact. Rather, it is possible to develop local policies with positive impacts that have negative consequences far away. Moreover, Seto concludes, there are other areas of research that might benefit from their findings, including environmental justice, sustainability and resource use. As is too common, there is an assumption that some sort of central planning is neccessary. It is not. land ownership is the best. Land ownershiop by the citizen with little to NO regulations. Humans will figure out how to survive while a collective will figure out how to perish. Always.